Last week, one day after my birthday, the vision in my right eye became distorted by what are known as floaters. After some internet research, I found it could be anything from a benign condition to something much more serious so I planned to seen an ophthalmologist in Grand Rapids but I got the call from Maddie and off I went. Maddie gave me today off so I made an appointment with the Michiana Eye Center. After an extensive examination, it was found that I had posterior vitreous detachment which is not uncommon of the geriatric generation. 🙂 No damage to the retina so I got that goin’ for me. Should improve with time and no treatment is necessary. Uncertainty is the gateway to anxiety (you can quote me on that) and when it comes to one’s health especially vision, the demons that may haunt your psyche can be daunting. Good to find it wasn’t as bad as I thought. I envisioned leaving the Center with an eye patch and goal of boning-up on my pirate lingo. ARRRG! 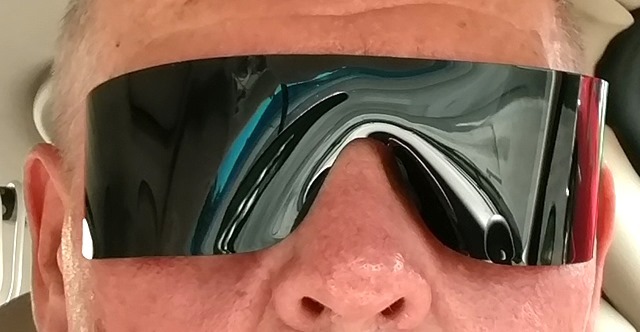 At least I got a cool pair of superhero disposable eyewear. This entry was posted on Wednesday, June 15th, 2016 at 2:15 pm and is filed under Uncategorized. You can follow any responses to this entry through the RSS 2.0 feed. You can leave a response, or trackback from your own site.